Cassius stood at rigid attention in front of the commanding officer of Jerusalem's military cohort. "Centurion," the officer barked, "explain yourself! One of your squads was assigned to guard a tomb, a dead man. What could be so hard about that? Now I'm hearing rumors that the body is missing? Tell me this is all a mistake!" "Sir, may I be frank, one old soldier to another?" asked the Centurion. He and the Tribune went back a long way, though the Tribune was of the equestrian class, and he a mere commoner. "Please, Cassius," he said somewhat more gently, and motioned for the Centurion to take a seat. "I must beg your indulgence, sir," Cassius began. "The story actually begins weeks ago." "Take your time," the Tribune said, relaxing somewhat. "Ever since this Jesus began preaching around Jerusalem, we thought he might be some kind of revolutionary bent on stirring up the populace with his talk of the Kingdom of God. But I went and listened to him, sir. He was no threat. Thousands would sit in rapt attention as he would talk about his Father, and loving your neighbor, forgiveness from past sins, and beginning a new life. It was fascinating, sir. Made you feel like he cared about you personally, he did." The Tribune was resting his chin on his hand. "Go on, soldier." "The next I saw him, we had been ordered to stand guard outside the Governor's official residence. The crowd was getting ugly. Pontius Pilate was sitting up there on the judgment seat and Jesus stood before him. Someone had roughed him up a bit, sir. "What did you expect, Centurion?" "Finally," Cassius continued, "Pilate motioned for silence. 'I find no crime in this man,' he called out. Then he tried to set Jesus free. He asked them to choose between Barabbas--a known murderer and rebel--and Jesus." "And now that criminal Barabbas is walking free again." "Jews from the ruling Sanhedrin were shouting, 'Crucify him! Crucify him!' The rabble took up the cry. It was touch and go for a minute there, sir. Then Pilate called for a basin, and began to wash his prissy little hands ...."
"Centurion, I'll allow no disrespect," the Tribune said sharply. "Yes sir, but you know Jesus was innocent, pure and simple. He had just offended some powerful priests. But when Pilate saw how the wind was blowing he went along. I thought Rome was about law and justice, not expediency." "Ruling is sometimes dirty business, Centurion," interjected the Tribune. "So is soldiering, sir. On your orders one of my squad was picked to scourge the man." "Oh, they enjoyed it well enough," said the Tribune. "That tall soldier ... Publius, wasn't it? He flogged like a madman, as I recall, with the metal tips of the scourge biting into his back until the skin lay in tatters and blood ran free." "Few times in my career have I been sickened by blood," commented Cassius, "but to see an innocent man treated with such cruelty...."
"I don't recall you stopping them from dressing him in a purple robe with a reed for a scepter and a crown of thorns. Oh, they were having fun, all right." "I've crucified hundreds in my time," Cassius replied, "but this man was different. He didn't curse. He didn't whimper. He was half-dead already from the beating Publius gave him, and he fell on the way to Golgotha." 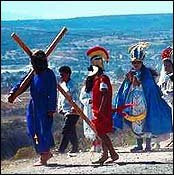 "He was just too weak to carry the cross, so we conscripted a strong Cyrenean to carry it. Then we crucified Jesus." "All men die the same." "Not like he did," replied Cassius. "We spiked him to the cross-bar and hoisted it onto the upright, but I'll never forget his prayer: 'Father forgive them, for they don't know what they're doing.' Sir, I was responsible for killing him, and he forgave me." "Haven't you been a soldier too long to be troubled by a guilty conscience, Cassius?" "Then the thief crucified next to him asked to be remembered when Jesus came into his kingdom." "His kingdom!" the Tribune sneered. "At that very moment the ground began to tremble and roll," said Cassius. "Knocked me to the ground for a moment. And then the darkness began to lift. I tell you, Tribune, that was no mere man we crucified, he was the Son of God." "A few freak coincidences and you're willing to declare him divine? He's just as dead as anyone." "The chief priests and Pharisees insisted that Pilate guard the tomb so Jesus' disciples wouldn't steal the body." "I know. I ordered it." "We posted three men around the clock, relieved every eight hours as regulations call for. I sealed the tomb before they began. It was secure." "So, what's this rumor that the body is gone?" "I'll have your hide, Centurion!" the Tribune shouted, rising to his feet. Cassius stood, too, but went on. "About seven o'clock Sunday morning, sir, the three soldiers on duty came running into the barracks like they'd seen a ghost. 'Centurion! Centurion!' they shouted. 'He's alive!' I got them calmed down, and made them tell me every detail. "Their shift had begun about midnight," he said. They had been wide awake all night--telling stories about their girlfriends back home most of the time, I understand. Then, just before dawn, they said the garden tomb lit up as if it were high noon, and an angel with garments like lightning came and rolled the stone away from the tomb. They just sat there trembling. Then one of them got up-- Publius, I think they said--and looked in the tomb. The body was gone, and the graveclothes were lying on the limestone shelf wrapped round and round, but no body in them." "You expect me to believe that?" the Tribune responded disdainfully. "I questioned them closely. Each looked. Each saw the same thing. The body was gone." "They must have fallen asleep, and told a story to cover themselves." "They were battle-hardened veterans, sir, not some green troops. I know those men. Besides, sir, you'd think the sound of people trying to roll a huge stone would awaken sleeping soldiers. No, they were telling the truth, all right." "What do you expect me to tell people, Centurion? That he rose from the dead?" "I don't know what you're going to tell them, Tribune, but that's what happened. He's alive. I tell you, he's alive!" "We'll tell the soldiers to say they fell asleep and his disciples stole the body," suggested the Tribune. "What soldier is willing to say he fell asleep?" asked Cassius with a thin smile on his face. "We'll pay them to say it," said the Tribune. "The chief priests owe us. They'll come up with a goodly sum to bury this story.... I'll take care of it from here on out, Centurion. You didn't see anything. You don't know anything. Got it?" "But I do know, and I did see, Tribune. I can't change what happened. Jesus is out there alive. More than alive." "Forget this ever happened, Cassius." "Forget it if you can, sir. But with all respect, Jesus is alive, and that changes everything."